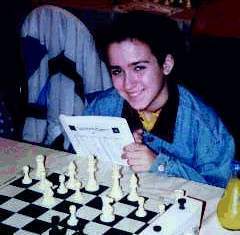 Over 310 players participated in the 6th Annual Western Class Championships, held March 28-30, 1997 at the Wyndham Hotel at Los Angeles Airport. The Continental Chess Association's annual Easter Weekend tournament had traditionally been held in the San Francisco Bay Area, but the lack of hotel facilities necessitated the migration southward. This year the tournament was bigger than ever, with a prize fund over $27,000. The Wyndham Hotel at Los Angeles International Airport proved to be a fitting venue, with bright, spacious ballrooms and plush interiors, all only a few minutes drive from the beaches and attractions of Southern California. The Master Section was particularly strong, with 37 players rated 2200+, including 5 players rated 2600+ and two(!) players rated over 2700! Among the assembled greats were no less than eight GM's and 2 IM's. No individual would command this pack, but the seven-way logjam at the end made it clear just how tough the competition really was. The First through Sixth Place prizes were shared among six GM's who scored 4½ points in six rounds: Lembit Oll of Estonia, Rafael Vaganian of Russian (the Number One and Two seeds, at 2758 and 2705, respectively), Alexander Baburian (originally from Russia, currently representing Ireland), Pavel Blatny of the Czech Republic, Walter Browne of Berkeley, CA and Eduard Gufeld, who moved to Southern California from the Georgian Republic. Joining this heady group was a real local boy making good, as Southern Californian David Glicksman's last-round victory propelled him into the Winner's Circle as well. Each of the lucky seven won $782. Oscar Maldonaldo of Los Angeles scored 4-2, as did Isaak Margulis of San Francisco and Alan Stein of Menlo Park. Their share of the Under 2400 prizes amounted to $684 each. James Jones of San Francisco, David Roy of Paramount, CA and Frank Sisto of Los Angeles divvied up the Expert Section quite nicely, with each of them winning $1,186 for scoring 5-1. Danilo Patricio of Santa Clara, CA was the tournament's Big Winner, scoring 5½-½ to take home the $2,052 First Prize in the Class A Section. Suqvi Demir took $753 back to Columbus, OH, as did Arthur Drucker of Sunland, CA. Both finished just behind Patricio, with 5-1. Jose Pacheco of Hawthorne, CA was the other player to strike it rich that weekend. He also scored 5½ points in the Class B Section, winning $2,052 as well. Five B-players tied for Second with 5-1: L.A.'s Romeo Milan; Stephen Sullivan of Freedom, CA; and Michael Frayer, Drayton Harrison and Iouri Plotnikov. Nine-year-old Adam Lischinsky of Palo Alto, CA will probably need a bigger piggy bank to hold all the money he won when he tied for First in the Class C Section, with Renato Soria of Anaheim. They each received $1,539 for finishing 5½-½. Vincent Bazemore scored 5-1 to finish Third with $479. 5½ was Rene Tolo's lucky number as well, because that was what the San Diego player needed to clinch the $1,368 prize in the Class D Section. Samuel Arabyan and Josh Smith had good luck with 5 as well, employing that score to tie for 2nd-3rd, Class D. Steve Henning won all six of his games to nail the lid on the Class E Section, while Juan Herrera placed Second with 4½. Austin Ong and Hovnan Arabyan both topped the Class F (Under 1000) Section with 5 points, but Ong took home the First Place trophy on tiebreaks. Michael Gayster posted the tournament's only other 6-0 sweep, placing First in the Unrated Players' Section. Kevin Koury and Paul Burtt had an enjoyable indoctrination into the world of tournament competition, when they finished their first tournament in Second and Third Place, with 5 points and 4 points, respectively. The Class E, F and Unrateds' Section awarded trophies to the top scorers in lieu of cash prizes, but the victories therein were none less sweet, to be sure. One of the features of the tournament which proved to be very popular was free analysis of the players' games throughout the weekend, provided by IM Jeremy Silman. Many players found these sessions to be very instructive and helpful in preparing for the next round. The 120 Grand Prix Point Western Class Championship was directed by Steve Immitt for the Continental Chess Association, assisted by John Hillery and Walter (M) Brown.